Our pastor at New Covenant, contacted me and Seamus earlier this week and asked if we'd be interested in opening up for worship this morning at both services. We responded, "Of course!" The "Call to Worship" is a 3-5 minute opportunity to awaken the body, to prepare our hearts for joyful worship. Needless to say, we were humbled and excited to be able to talk about our adoption with the ones we love most. More importantly, we were going to have the opportunity to share our testimony of who we are (adopted sons!) in Christ. If you know Seamus, you know that he loves the Lord with all his heart and loves the opportunity to live out the gospel. His gift is speaking to people face to face, informal, and impromptu. He abhors being the center of attention. I think he'd rather be stung by a thousand jelly fish. Okay, that's pushing it but he really doesn't like talking in front of a congregation of people. You get the point. It was hard for him. But y'all, my man is one special guy. Seamus' testimony this morning was less about our adoption of Emily Hope and more about who our God is. 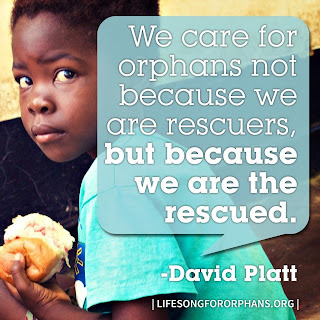 He shed light on our adoption in Christ. Our story this morning wasn't our story at all. It's God's story. Adoption is what He does. It's who He is. This is the reason we are adopting a fatherless child. It is an expression of who God is and all that He has done for us. It is our desire and our goal in life to be an example of who Christ is. "Be imitators of God, therefore, as dearly loved children and live a life of love, just as Christ loved us and gave himself up for us." (Ephesians 5:1) We don't need to adopt a child. We don't need to grow our family. We have a wonderful life. And frankly, our salvation is secure because of His grace. We're certainly not doing it out of obligation. We are perfectly content. But the truth is, our hearts groan for more and "content" is just not fulfilling. Our ministry of adoption is our worship to Christ as an outpouring of our thankfulness. So here's my call for all of us to worship... (echoing Seamus' words... the Spirit's words really... from this morning) Let's be thankful, reminded of His sacrifice- His blood that was shed, His infinite love, and His worthiness of our praise. And in our thankfulness, let's worship Him in all we do, whether that be through adoption or caring for "the least of these" in other ways that reflect who Christ is and all HE has done. I'm proud of you, Seamus Martin. I love you to pieces. I'm even more thankful to my precious God who provided the opportunity, the peace for Seamus to make it through, the wisdom to recognize who Christ is, and our burning desire to share this story with others. These gifts only come from our perfect God who made the perfect sacrifice to adopt us as His sons! Thanks for including us in this great calling. Can't wait to see Emily Hope safe in your arms -- until then, may she feel the love of our Father and those who love her half way around the world. Amen and amen! I love you and I'm so thankful to be witness to how the Lord is drawing your family closer to Christ through this process. The way y'all are continually giving God the glory is a blessing and encouragement. Much love my friend.